The other Saturday morning Stuart and I took a free Islington Pride Walking Tour. And it was fabulous. Not only was it fabulous but fascinating, hugely enjoyable and informative. The walk took in many of the important facets of Islington's LGBT history, from the places Joe Orton lived and hung out to the sites where many LGBT firsts happened (such as the first gay marriage and the first gay rights march). We visited lots of old gay haunts too - the Eddie, the house where Derek Jarman lived, where the Sisters of Perpetual Indulgence had their squat in Cross Street, the South Library where Orton and Halliwell's books were vandalised, the old male impersonator theatre on Islington Green, where many of the 'cottages' used to be, the pub where the underground lesbian bar used to be in the mid-1980s, where Gay Switchboard used to be before it moved to Kings Cross, where London Friend used to be, where Gay Sweatshop rehearsed, the site of the first gay protest on Highbury Fields, the Town Hall where the first gay marriages were held, the list went on and on. The walk lasted for about 90 minutes and ran from the Angel, Islington to Highbury Fields, so not too long either in time or distance. Highly recommended! 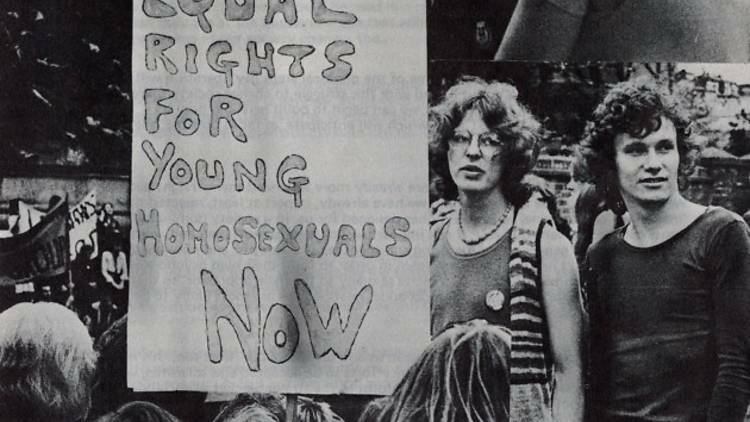 The walk is run by Clerkenwell and Islington Guiding Association guides and thoroughly explored the heritage and stories held in the Islington’s Pride Archive.